PLEASE SEE MY OTHER AUCTIONS. 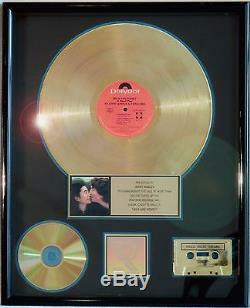 THE BEATLES JOH LENNON RIAA RECORD AWARD GOLD. It is the first posthumous release of Lennon's music, having been recorded in the last months of his life during and following the sessions for. 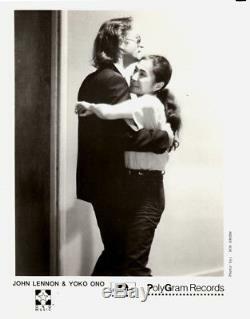 Milk and Honey was the duo's projected follow-up to Double Fantasy, though Lennon's death caused a temporary shelving of the project. It took Ono three years to be able to resume work to complete it. Ono's material largely comprises new recordings, which she undertook during the album's preparation in 1983, which give her songs a more commercial and contemporary edge. Conversely, Lennon's material, being rough takes and rehearsal recordings, has a more casual feeling. Predictably, the reaction to Milk and Honey was less fanatical than the one that greeted Double Fantasy, but it was still well-received, peaking at #3 in the UK and #11 in the U. After a falling out with. Had initially released Double Fantasy. Ono moved future projects to. Which initially released Milk and Honey. Home of Lennon's entire recorded outputincluding that with. Acquired this and all Lennon releases in the late 1990s. IT CONTAINED THE HIT SINGLES. EVERY MAN HAS A WOMEN WHO LOVES HIM (2001). This is the genuine article, authentic RIAA award. It is in the original format, most awards of this age will have a nick here or there, this particular award is in. EXCELLENT VINTAGE CONDITION SOME FLAKING NEAR THE LABEL This award measures 17x25. Presented to a Record Exe. Studio, RADIO STATION, Production team, or any significant INDIVIDUAL(S) who contributed to the success of this artist or Band. This is the award that everyone in the recording industry recognizes, (RIAA) this is an achievement award, not a fancy wall decoration, these items are very rare. The collectable value of these awards can involve many factors such as: The Artist, living or dead, its overall condition, the title, Platinum or Gold, and whom the plaque is awarded to. An RIAA holographic seal incorporating the RIAA logo has appeared on all RIAA plaques since March 1985. The hologram is used to prevent unauthorized duplication of awards, and usually appears on the presentation plate along with the dedication and mini-album cover. After the hologram style of awards was introduced (1985), the tradition size and style restriction for awards were relaxed, giving the record companies more freedom in choosing a design for a particular award. If for any reason you feel we do not deserve 5's in all areas, please notify us so we can address the situation. The item "THE BEATLES JOHN LENNON MILK AND HONEY RIAA RECORD AWARD GOLD" is in sale since Wednesday, March 21, 2018. This item is in the category "Entertainment Memorabilia\Music Memorabilia\Rock & Pop\Artists B\Beatles\Records (Vintage & Awards)". The seller is "gavin95" and is located in Elizabeth, New Jersey. This item can be shipped worldwide.